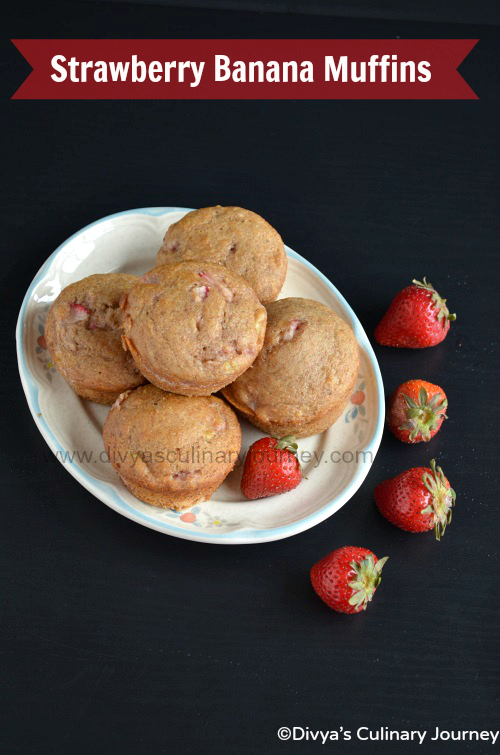 Today's recipe is Strawberry Banana Muffins.I had ripe bananas and strawberries at home and My kids love muffins.So decided to bake muffins in that combination. I wanted them to be healthy so used whole wheat flour. The muffins were so soft, moist and delicious. Kids loved these muffins and they got over the same day of baking. Prepare the muffin pan by greasing and flouring it or just by using paper liners. Keep it aside. Peel the skin of the bananas, mash them well and keep them ready. In a bowl, first combine together all the dry ingredients(Whole wheat flour, all purpose flour, baking powder, baking soda & salt). In another bowl mix together yogurt, light brown sugar, honey, oil, milk, vanilla extract and mix well. To this mixture add the flour and mix well. Then add the mashed bananas and strawberries and mix till they are combined well. Pour this batter in the prepared pans till they are 3/4th cup full and bake for 15- 20 minutes till they are done (to check if it is done, insert the tooth pick and it has to come out clean). Let the muffin cool for few minutes before removing from pan. Remove from the pan & Enjoy the muffins. You can adjust the sweetness of the muffins as per your taste. Oven timings varies with oven, check yours accordingly. 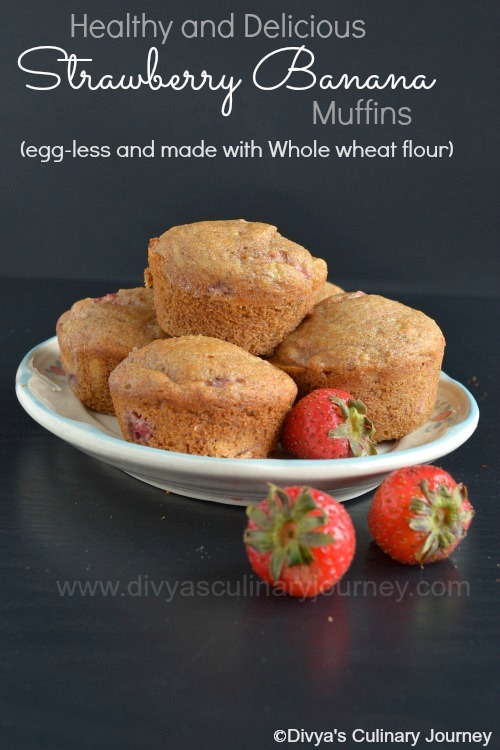 really healthy recipe with wheat flour...looks delicious.. Delicious muffins great way to start a day with it. Very healthy and yummy muffins.. 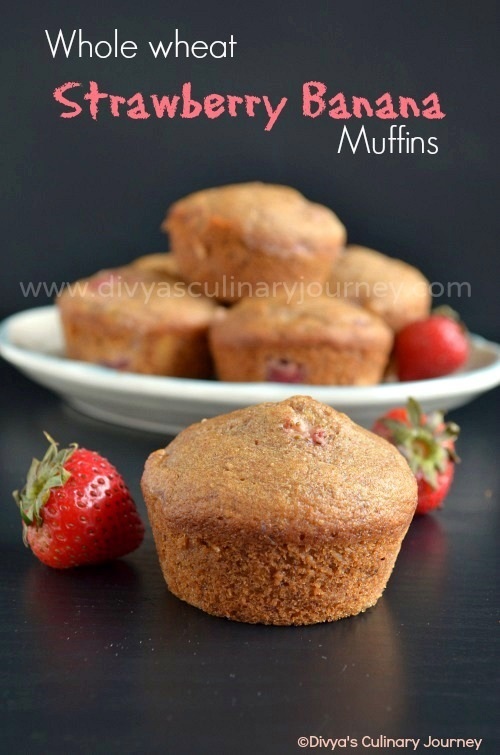 Healthy muffins.. And looks very appetising :) Bookmarked !! i bake them similar but only banana's and my hubby love that for breakfast...easy and tummy filling. i just need these kind of healthy muffins :) lovely presentation da..
Looks beautiful and healthy as well :) perfect as a breakfast choice! perfect way to use up fruits at home. They looks super spongy and very attractive, love to start my day with it. They look so perfect and healthy with the whole wheat flour.. Tried this out today. ridiculously tasty. Awesome!